The fall calendar in Mexico is filled with holidays. At least 10 holidays occur during September, October, and November. Perhaps the best known to tourists are the religious holidays, especially the Day of the Dead. Visitors are less likely to be aware of the fall Federal holidays unless they experience the sudden interruption of normal services. They may try to exchange money at a bank and find all financial institutions are closed. Hotel guests or condo renters may notice that usually well-staffed places are suddenly pressed to meet guests’ needs. Offices are likely to be shut tight on Federal holidays. And hotel rates may go way up on days that to foreigners seem ordinary. Mexicans take their holidays seriously. By law, banks must be closed. And Federal legislation guarantees that employees must be given a paid day off for Federal holidays or be paid their regular salary plus a large overtime pay. Instead of being annoyed by these disruptions, read this article and enjoy the celebrations. Here are the dates and the festivities in which you can participate. September 16 is Día de la Independencia (Independence Day). The holiday commemorates the start of the revolutionary war in 1810 to gain independence from the Spanish-born rulers – the Gachupines — who had for centuries oppressed the Criollos (Mexican-born Spanish), the mestizos (mixed Spanish and native Indian people), and especially the Indians. The oppression had become extreme under the protection of the French-colonial Napoleon Bonaparte regime, which conquered Spain in 1808 and then in turn dominated Mexico. Small groups of Criollos began discussing plans to revolt. The Gachupines uncovered these plots and ordered the mass arrest and execution of the incipient revolutionaries and their sympathizers including Father Miguel Hidalgo y Costilla. All of Hidalgo’s humane activities were outlawed by the French-colonial government and he was placed high on the hit list. Fortunately, one of his revolutionary colleagues, Ignacio Allende, arrived in Dolores on September 13, 1810, to warn Hidalgo and urged him to flee. It took three days for Hidago to make the most important decision of his life. On the morning of September 16, Father Hidalgo asked for all the church bells to be rung. When the largely Indian and Mestizo crowd gathered, he called on them to arrest the local Spanish-born and recover the lands that had been stolen from earlier generations. The actual words of Father Hidalgo were not recorded but his passion and the adoration of the Indians led to the first battle of revolution four days later. The war lasted over a decade and finally ended on September 28, 1821. This scene is reenacted in many cities and towns across Mexico, most notably in Mexico City late in the evening on September 15. The ceremony, known as El Grito (The Shout), begins in Mexico City with the ringing of the bells at the National Palace in the center of the city. The scene is far from solemn with thousands of revelers, bands playing patriotic music, and, of course, fireworks. When the President appears on the balcony of the National Palace, the crowd, independent of their party affiliation, goes wild. Virtually all respond to each short slogan shouted by the President with a thunderous, “Viva!” El Grito always ends with the President’s shouting “Viva” three times, echoed by thousands of voices each time. The Mexican flag is waved by the President to deafening applause, and after the crowd sings the National Anthem, the music and fireworks start up in even greater profusion. In addition to El Grito ceremonies, the holiday is celebrated by parades, military music, and political speeches. In many towns and villages, people wear traditional dress and there is music and dancing in zocalos, parks, and streets blocked off for the festivities. The special food for the holiday includes chiles en nogada, a delicious dish that has the colors of the Mexican flag- red, white and green. (For a recipe see the August 2015 issue of The Eye.) The third Monday in November, formerly November 20, is Día de la Revolución, Revolution Day. The holiday commemorates the beginning of the Revolution that began almost exactly a century after Hidalgo’s Grito, in 1910, and lasted more or less until 1920. On that day, Francisco Madero, who had just been trounced in the blatantly rigged presidential election by long-term dictator Porfirio Díaz, challenged the people of Mexico to rise up against the Díaz regime and implement the Constitution ratified in 1857. Mexicans were at first ambivalent. The country had greatly prospered under the rule of Díaz and his robber baron henchman. Infrastructure including railroads, paved roads, and technological innovations were in place, the currency was strong, and international trade was thriving. However, middle-class Mexicans who were not part of the regime could not advance politically, and courts were biased against them. Laborers – Indians and Mestizos – had been marginalized and personally gained little or no benefit from the new prosperity. Especially to the laborers and their families, Madero’s challenge rang true. Díaz was disposed six months later, but his absence led to a vacuum in leadership, and bloody battles between different groups seeking to control the government went on for years. 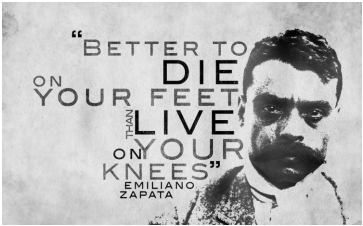 Many of the figures involved in the struggle – including Emiliano Zapata and Francisco “Pancho” Villa became well known in the world due as much to Hollywood films as for their actual activities. In 1917, a new Mexican Constitution was written that gave more power and privileges to the vast majority of Mexican citizens and finally, as called for in Father Hidalgo’s Grito – land reform. For a short while it appeared as if the revolution was over. But then President Venustiano Carranza was assassinated in 1920. So the “true” end of the revolution is noted as the assumption of the presidency by General Alvaro Obregon on December 1, 1920 – even though Obregon was himself assassinated on November 30, 1924. Unlike Independence Day, which rings with patriotic ceremonies around the country, Revolution Day is observed more as a three-day weekend for workers and as the time for getting great bargains in stores. Sales bring out shoppers in droves. Unless you are really hankering for a low cost appliance, the Revolutionary Day weekend is not an ideal time to explore the stores. But do remember that banks will be closed. Also note that December 12, the Day of the Virgin of Guadalupe, although a religious observance, is a bank (but not a federal) holiday. Visitors to Mexico, especially Huatulco, will readily notice the many stately but joyous processions that accompany this celebration. Pilgrims bring flowers and images of the Virgin, perform dance and song, and eat traditional foods. Huatulco is one of the country’s significant gathering places on this day because of the dramatic ceiling painting of the Virgin of Guadalupe in the church facing the plaza of La Crucecita. The largest destination for pilgrims on December 12 is Villa de Guadalupe Hidalgo, a northern neighborhood of Mexico City. The story behind the celebration is how Catholicism became acceptable to the natives of Mexico, who had resisted the religion of the Spanish because they had their own gods. A vision experienced in 1851 in this neighborhood of Mexico City resulted in blending the old and new traditions and continues to be celebrated with reverence and joy. Wherever you are in Mexico during the fall federal holidays join in the celebration and do what the Mexicans do so well– fiesta, fiesta, fiesta.